It’s been over a year since my first post regarding the SiteBuilder program from Homestead so time for an update. Homestead began in 1996 and although a bit ragged around the edges, it quickly outdistanced it’s then competitor GeoCities and became a vital resource for people who wanted to build their own websites and for designers looking for a good platform on which to build and design sites for clients. The program continued its advance into the web site building world gaining many thousands of customers. Enter Intuit. In 2007 Homestead was purchased by Intuit and thus began the slide down the slippery slope. Customer Service became a joke, outsourced to the Philippines; they stopped making upgrades to the desktop version and threw up a web-based editor that was buggy and worthless. No disclosure was ever made to existing customers about what their intent was in regards to eliminating the Desktop version – no straight answers could be wrung out of Tech Support and the program (both versions) started becoming unstable. Plus no doubt because it was some pieced together program they tossed out and Desktop because they had basically stopped supporting it except for a minor update now and then. Homestead and Intuit were never a good fit. Which brings us to 2013. Intuit sold the Homestead web site builder to Endurance International. What? You didn’t get the memo about the sale or what EI’s intent was/is in regards to Desktop SB? Neither did anyone else to my knowledge. Granted, they are in the transition stage, but still, it would have been nice to get a little note explaining that the program thousands use to promote their businesses, hobbies, etc. was under new management and maybe an inkling as to the direction new management intended to go with the program. Once again I’m back to asking questions and not getting many answers. The only thing I was told with any degree of certainty was that Homestead (yes, we’re back to being just Homestead with no Intuit stuck on – YAY!!) is going to move Tech Support back to the states! Three cheers on that one. What are they going to do with Desktop? Dunno folks. I’ve asked for input from Homestead and to date have not heard anything. As I stated to Sandy, we have not made any decisions concerning Sitebuilder Desktop, yet. We hear you. We know we have customers that prefer desktop to browser based Sitebuilder. We also have customers that prefer Sitebuilder Plus. With that said, we don’t have the resources to make improvements to the desktop version right now. We haven’t made improvements for some time but we are evaluating whether or not we need to prioritize that type of work. I don’t have an answer on when we will get to those types of improvements. We’re still working on moving away from Intuit. There are a couple of statements in there that made my teeth hurt. The first being that they have customers who prefer SB Plus – ohhhhhhhhhh, I so don’t think so. The only people who prefer Plus are the ones who have no clue that there is a better version. And the second really got my fillings pinging – we don’t have the resources to make improvements to the desktop version right now – EXCUSE ME! There are 1000s of users out there who have been loyal customers for many years who signed up for and are paying for that very version! The only way we are going to save Desktop from extinction is to be the squeaky wheel – cast your vote Here, comment to this post, post on the thread given above and keep the pressure on. Thus, a year and a half down the road we’re still waiting for the other shoe to drop. Posted in SiteBuilder Program, Web news and views, Website Design and tagged Homestead, Homestead desktop sitebuilder, Homestead SiteBuilder Plus, Homestead users, Intuit Websites by Homestead, Site Builder Plus. Bookmark the permalink. Spring is here! It’s a good time to get your Homestead-Intuit website in tip-top condition. When was the last time you took a good close look at your website? We make quick changes now and then, but don’t usually pay attention to the big picture. A website can always use a bit of maintenance because errors tend to happen. A website that is error free is not only important for visitor retention, but is part of good search engine optimization as well. Spelling errors – spell check is great but won’t pick up homonyms (two words pronounced the same, with different meanings); weather/whether, break/brake for example. Overlaps – the border and bullet elements in SiteBuilder add padding and can throw off the placement of elements. Finding these requires checking the site in different browsers as each browser handles coding a bit differently. Grammatical errors – Poor grammar can reflect negatively on your service or product. Outdated information or events that have passed scream site neglect. Broken links – they happen to the most diligent of webmasters. The dreaded red X – this happens too. An image name is changed or it’s moved from the original location breaking the link to the image/graphic. Stray element boxes should be eliminated. It’s easy to create a text box, get distracted and forget you made one. Using the Select All option will show all the elements on a page – including ones that shouldn’t be there. Check the spelling in your Meta Tags. Page titles, descriptions, and key words often contain errors. Copy and paste them either to Notepad or directly onto the page to check them. We tend to see what we know/think should be there rather than what actually IS there. If you have a really good friend, willing family member or co-worker who has time on their hands, enlist them to help proof your site. A fresh pair of eyes can help pick out those errors that you might be overlooking. If you don’t have someone who can assist then look at your website in a different way when you proof it. Start at the back (last page) and work forward. Read from bottom to top. Copy the page content and paste it into notepad or Word and increase the font size. Keeping your website in good shape will show visitors and the Search Engines that there is webmaster activity on the site making it more credible to both. Download the free Website Design Guide to refresh your memory on the do’s and don’ts for websites and incorporate necessary changes when you are tuning up your site. Posted in Search Engine Optimization, Website Design and tagged Homestead, Intuit Websites by Homestead, links, meta tags, Search Engine Optimization, web site optimization, Website Design. Bookmark the permalink. Besides the school-yard spitting match going on between Google and Bing (For more on the spitting match just do a search for Google and Bing click fraud – everyone has jumped on that posting bandwagon. ), the latest news concerning Google is that they are about to shake up search results in an effort to reduce the incidence of spammy sites coming up prominently in those search results. I’ve longed for the day when sites that offer visitors little in the way of original content and consist of nothing but links and clickable ads that will bring the site owner in $$$ and webmasters who copy and use other’s work, would end up in the nether-world of the www. Perhaps that day is coming. It’s time to take a good, hard look at your Site Builder website to be sure it is going to stand up to the new search standards. Does the site have informative content? A bunch of links and ads are not informative content. Is it original content? Have you duplicated that content elsewhere? On a blog or in articles posted to different sites? Or perhaps it is content taken from another site? Does the site employ black hat techniques? Keep an eye on your site placement over the next several weeks. There are no absolutes and nothing to say that the new algorithm won’t make mistakes and drop a good site. How to request reconsideration of your site. Posted in Search Engine Optimization, Webmaster Tools, Website Design and tagged Google, Homestead, Intuit Websites by Homestead, keyword density, search engine placement, search results. Bookmark the permalink. The frame – border element option in SiteBuilder adds functionality to the program and is a nice tool to have. The border appears to be a rectangle but in reality it is a graphic with colored edges and a transparent center. This means that when you place a border or frame around something you are actually placing the graphic OVER the item. If you have any links within the text block you are bordering or on a photo, those links will not be clickable as they are covered by the border element. An example of this can be seen at the Homestead Connection. It is important to remember to send your border elements behind the graphic or text in order for any links to be available. 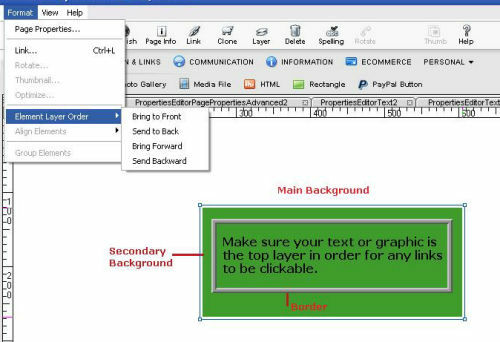 If the area where you place the border is an element other than the main background use the Send Backward option rather than Send to Back. Posted in SiteBuilder Program, Website Design and tagged design tips, Homestead, Homestead users, Using Site Builder. Bookmark the permalink. You know how sometimes things just gnaw at you and even though you try to shrug them off they seem to constantly rear their heads and demand attention? This particular issue has gnawed long enough and its time to get it out there. They say that imitation is the sincerest form of flattery … but when it comes to claiming it as your own that’s a whole new ball game and when you do a lousy job of it that’s even worse. The real kicker though is charging people for so-called expertise taken from someone else, edited just enough to maybe avoid copyright infringement and then presented as your own in an amateurish manner. So what, you ask, is this all about? A couple of years ago this person showed up on the HC Forum asking for help. He knew nothing about search engine optimization and had a site that was very poorly designed (and unfortunately it was a site he was designing for some unsuspecting soul). Judy and I gave this fellow a ton of help and he purchased our book, SEO Building Blocks™. The next thing we knew he began promoting himself as an SEO expert (remember, this is the guy who just a couple years ago didn’t even know how to spell SEO and you definitely DO NOT become expert in SEO in a couple of years) and selling information via videos (very poorly done and lacking in good/correct info.) and documents. Pity the person who purchases as they are not going to be getting expert advise, rather they will get info harvested from another source – in trying to escape copyright infringement he did a lousy job so the ‘expert advise’ is outdated and often incorrect. He has even gone so far as to incorporate the term Building Blocks into his content. Obviously integrity and honesty aren’t words in his vocabulary. So buyer beware, if you are an Intuit – Homestead user and need some help with SEO, make sure that the source you purchase from is legit and truly knows the ins and outs of search engine optimization. Make sure that the seller is providing you good, quality, up-to-date information that will help you succeed on the WWW. We have over 25 years of combined experience in design and SEO and the Site Builder program. And, ‘We wrote the book on SEO for Intuit – Homestead sites’®. If you want the ‘real deal’ visit us at SEO Building Blocks for information on the ebook that can truly offer you insight into search engine requirements and help with optimizing your website. Thanks for letting us get this off our chests! Posted in Search Engine Optimization, SiteBuilder Program, Website Design and tagged Homestead, search engine optimization for Homestead websites, search engine requirements, SEO, SEO Building Blocks, site builder. Bookmark the permalink.